IBM Corp. yesterday announced a new software and services suite with multi-level support for service oriented architecture (SOA) – from design and assembly to deployment and management. The offering consists of new and enhanced middleware technologies, based on IBM’s WebSphere product portfolio. These enable businesses to build an SOA environment by effectively integrating business processes and existing applications, according to Steve Mills, senior vice-president and group executive for IBM’s software group, based in Armonk, NY. IBM’s SOA offerings are not entirely new, but the company has created a package that “makes sense” for businesses, said Joanne Friedman, CEO of Connekted Minds Inc., a Toronto management consulting firm. “What’s old is new again. Because [IBM] has created a synergistic solution that allows you to go from one end of the spectrum to the other – you can model the SOA and there are rules that govern that modeling. [IBM has] covered the base, which is very good news for small and medium-sized enterprise,” said Friedman. He alluded to the growing adoption of Internet standards, Web services, SOA and open middleware standards designed to enhance interoperability, and enable businesses to work together more effectively. Big Blue’s SOA foundation portfolio includes the WebSphere Business Modeler, that enables users to design and model the SOA process flow, and WebSphere Integration Developer, a tool that allows application developers to view existing IT as services that can be interconnected to create full business processes. For SOA deployment, IBM offers the WebSphere Enterprise Service Bus (ESB), which integrates Web-based applications and services. WebSphere Process Server is IBM’s new open standards-based software powered by WebSphere ESB. The product helps enhance business process integration across people, systems, customers and business partners. 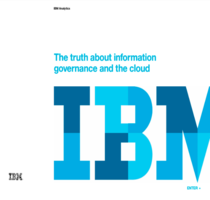 It helps reduce cost and time by easing the movement of information between applications, based on business rules, said IBM. IBM also announced enhancements to its WebSphere Business Monitor, which manages the SOA by monitoring business process and performance indicators. The software allows IT managers to understand and evaluate the health of the business process. To sustain the SOA foundation software portfolio, IBM will offer professional support services such as governance, which provides a framework for measuring improvements, tracking projects, building resources and establishing best practices for SOA initiatives. IBM is also offering vertical industry expertise through its Business Consulting Services division to simplify deployment for customers and help them to generate business value faster. Freidman said IBM’s SOA portfolio has “leveled the playing field” for both large enterprises and SMBs by providing the capability to support any phase of an SOA deployment – from discovery and modeling to advanced stages of creating a full-blown SOA.